Did you know that every Jedi lightsaber is powered by a rare item called a Kyber Crystal, otherwise known as the living crystal? Each Jedi has to build his or her own lightsaber with one, so that they eventually become very personally connected. It probably isn’t that feasible for you to travel all the way to the icebound caves of the planet Ilum to get a crystal for yourself, but you’re in luck anyway, because we have a number of lightsaber accessories here for you to equip yourself with. This Anakin Skywalker Lightsaber Accessory, for instance, comes with his iconic blue beam and custom handle design. 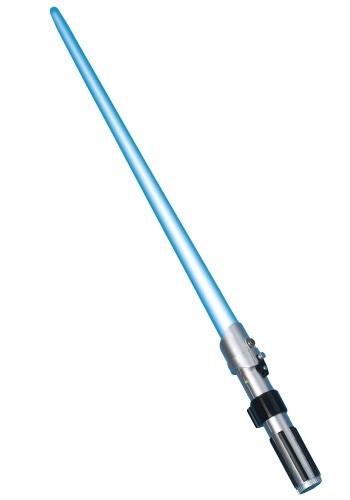 Who doesn’t want to wield the lightsaber of Anakin Skywalker? Even Luke later picked it up as his own, until it was lost on Bespin after an unfortunate...disarming. In any case, pick up this fun, battery operated accessory and feel the power of the force flow through you, and complete your Jedi look for any occasion. It looks awesome, but doesn't light up. This lightsaber's is pretty cool. The handle is very realistic looking, and the blade extends easily with one movement. But we tried several sets of batteries, and it isn't lighting up. I can't return it because I don't live in USA, so there's not enough time before Halloween; and the shipping costs would be more expensive than the lightsaber itself. So, unfortunately, it will have to do without light.